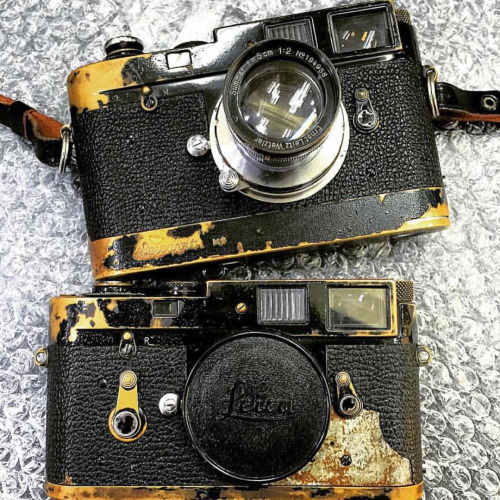 Found this picture of two well-used Leicas floating around the net and know nothing about their provenance except the obvious: two black paint M2’s, one with an MP Leicavit and what looks to be a collapsible mount uncoated Summar 5cm f2, (although the serial number indicates a production date of 1933, which is claimed to be the last year Leitz made the Summar in a rigid mount prior to introducing the new type collapsible). The Summar was Leitz’s “fast” 50mm, produced between 1933 and 1939. It was generally considered inferior to the Zeiss 5cm 1.5 produced in Jena for the Contax and for a limited run in LTM during WW2. This entry was posted in Black Paint Leica, Collectible Leicas, Leica M2 and tagged Summar 5cm on January 9, 2016 by Leicaphila.